Bacolod United FC beat Ex-Malay Mail Veteran FC 3-2 in the final of the inaugural Philippines-Malaysia Veteran Soccer Tournament 2009 at Panaad Stadium in Bacolod City yesterday evening. For the visitors it was an achievement reaching the final itself. The team came for the tournament with only 13 players and many of them played with injuries or were a spent force by the time they reached the final at the end of the two-day tournament. Matches were played over thirty minutes each half and Malay Mail were playing their fourth match of the tournament in the final. But it was sheer determination and guts led by skipper Hasnul Ramlan Khairuddin, that saw Malay Mail score the first goal in the final through former Kedah and Kuala Lumpur midfielder Mohd Faridzul Kassim. The Malay Mail was bent to seek revenge for their earlier 2-0 defeat by Bacolod City in the Group match. The Ex-Malay Mail team and Bacolod United FC pose for a team photograph before their Group match on Saturday. But the match officials had different ideas. Two poor decisions by the referee and his assistant from Ililo City, saw Malay Mail trailing at halftime time. Bocolod United's first goal was through a penalty offered to them when Hasnul was shielding a ball which was going out of play. Despite protests from the players with the referee, he stood his ground. The second goal was a clear offside, which the assistant referee choose to ignore. Both goal were scored by former Philippines national player, Norman Fedidero Jr, who is famous in his country for the goal he scored against the Malaysian national team for their 1-0 win in the 1991 Sea Games in Manila. However, Malay Mail undeterred by the setback, came back strongly to find the equaliser through U. Supramaniam in the second half, but only to concede a late goal scored by Greg Gustilo, to go down to Bacolod Utd. FC. Malay Mail reached the final yesterday, after collecting three points through default from their first game against ERCO Cebu which they lost 4-1. But the Malay Mail team sent in a protest to the organising committee of their suspect that the opponents had violated the eligibility rule of fielding more than three 35 years old and above. The tournament eligibility rule states that teams are allowed to register ONLY THREE players who are above 35 years old and the rest must be 40 years above. Malay Mail won the protest, as the organising committee after checking the identity cards of the players of ERCO Cebu, found out that they had fielded 6 players who were below 40 years. After going down to Bacolod City 2-0 in the next Group match, a do-or-die mission was at hands for the final Group match against Real Negrense. Malay Mail battled to win the match 4-3 and qualify for the final. Utility player Masaaud Zain scored the first two goals with his clinical headings, while striker U. Supramaniam scored the other two goals. Malay Mail came back into the game from a goal down, before going three up. Then Real Negrence narrowed the lead, before Malay Mail score for a 4-2 score. Negrence then scored another for the final score. It was a great tournament with the Philippines FA directly involved in the organisation of the tournament. Even the national anthems played before the match after a walk-in for the match with the FIFA Fair Play flag to make the tournament world -class. The Panaad Stadium was an excellent venue and the hospitality was first-class, as the people of Bacolod are known for. For the Malay Mail team, it was great coming back to Negros Occidental (Bacolod City and Iloilo City) which holds fond memories for many players who during their younger days played in the Philippines Cup from the inaugural tournament in 1991. Kudos to organising chairman, Rafael T. Lizares Jr, PFF secretary, Cyril V. Dofitas, and Match Commissioner, Warren Conception. This tournament will definitely be an annual affair and with every signs that is going to get bigger with more teams participating. Plans are to have the second tournament in May next year. The tournament concluded with a Victory Dinner at the poolside of the Luxur Place (official hotel) last night. The Malay Mail received accolades from the host and also local newspaper Sun Star, which commended the team for having initiated this tournament and getting the support of FA of Malaysia too. Columist for Sun Star, Henry C. Villalva, had his heading for his column read: Malay Mail's shot in the arm for Philippine football. He praised the team not for rekindling the traditional Philippines-Malaysia soccer ties, but more importantly said the tournament was able to re-ignite the special football link between Bacolod City and the Malay Mail which first started in 1991 when the team competed in the President's Cup invitation tournament organised by former Bacolod Councilor and then president of the Negros Occidental Football Association (NOFA, Cano Tan. Cano Tan, who will be running for Congressman of Bacolod City in the coming elections early next year, hosted the whole Malay Mail team for a sumptuous lunch at his residence on Monday. The team would like to go on record to thank our many supporters for making this trip possible. They include Datuk Azzuddin Ahmad (FA of Malaysia) Datuk Abdullah Hishan, Ng Ping Loong (MILO) rally driver R. Gunaseelan, Andrew Gopal (UKRC), Terence W.K. Cheong (LINE 7), Abdul Khani Daud and Mohd Sori Ismail (Tourism Malaysia), Chris Thiagarajah (SKYBUS) , Rafael T. Lizares Jr (Luxur Place), Robert Lazarus (WRL Advertising n Production (M) Sdn Bhd, K. Kannan, Datuk Choi, Mohd Rasol Raman Mustapha, Tengku Noriza Tengku Ramli and all others who have supported in us in one way or other. Appreciation and many thanks also to our friends in Bacolod City, Joey, his wife Lesley, daughter Nikki, Jerry and his wife Taa and children Gwen and Daniel for being a perfect host in looking after us during our stay. The Ex-Malay Mail team during their stay in Bacolod City, also made a presentation of two sets of old jerseys (courtesy of UKRC), Milo T-Shirts and Milo drink sachets and balls to a local schools soccer development programme. The team returned home early this morning (Wednesday). Come May, the ex-Malay Mail team will return even stronger, for they intend to start regular friendly matches every fortnight as part of their preparation for the tournament. This time, they definitely intend to return with a bigger and stronger squad. In all probability to accompany them in May will be close friends of the team, UKRC and probably either International Football Club (IFC) or team from Penang. Plans have been finalised for IFC to play a friendly match against Bacolod United FC on January 28 next year. The team is going for a holiday. The arrangements were made by the scribe who is close with Cano, the former PFF secretary, Edward Magalonna who played a key role in making the tournament over the weekend a reality and current PFF secretary, Cyril Dofitas. Indeed, the fire in Bacolod City has been rekindled! The jerseys and Milo T-shirts and sachets being presented to the Edward Magollana, the former PFF secretary-general, and the coaches, who are involved in the development programme. The Ex-Malay Mail team with the local school's soccer development programme children and their coaches after the presentation. Salvador who pipped Kalimutu to the Veteran of the Veterans Individual title. Kali a double international (soocer and hockey) is 63 years-old. Skipper Hasnul leading the team out. Entertainer......Kali entertaining everyone after lunch with his renditions of songs. The Ex-Malay Mail FC veteran soccer team will be competing in the inaugural Philippines-Malaysia Veteran Soccer tournament at the Panaad Stadium in Bacolod City over the weekend (Oct 24 and 25). The tournament is the initiative of the Philippines Football Federation (PFF) and The Ex-Malay Mail Veteran football team. The Malay Mail team leave tomorrow night (Thursday) with captain Hasnul Ramlan Khairuddin leading a 13-players squad. The rest of the players include players like Mohamad Omar and A. Gunasegran, who played for the NST team as early as 1977. Other notable names include Mohamad Faridzul Kassim who played for Malay Mail in the FAM Cup campaign in the 90s. Initially, three teams from the Philippines, including host Bacolod City, and three teams from Malaysia were supposed to participate in the tournament, but due to time constraints and other commitments, only The Malay Mail team is representing Malaysia. Certainly, this tournament is not going to be a one-off affair but an annual one. The FA of Malaysia supports the participation of The Malay Mail team and commended its efforts to initiate the tournament. With the backing of the PFF, the tournament is indeed going to grow into a key event for Bacolod City. The PFF’s secretary-general Cyril Dofitas personally oversaw the run-up to the tournament with the local organising committee and will be in Bacolod City during the tournament to ensure that everything goes smoothly. The Malay Mail team is no stranger to the Philippines, especially Bacolod and Iloilo City. The newspaper team competed in the inaugural Philippines Cup in 1991 where it finished runner-up to the Chinese Taipei national team. It participated in two more tournaments and played numerous matches with the Philippine national team, both in Manila and Kuala Lumpur. Many of the current veteran players were part of The Malay Mail team at one time or another when it played in the Philippines. 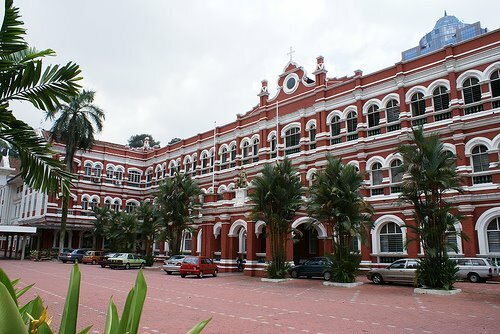 The Malay Mail team saw its birth in 1989, when they changed their name from New Straits Times (NST) to The Malay Mail for branding purposes. It rose from competing in the domestic KL Dunhill League to play in the FAM Cup (national club championship) before earning promotion to the M-League Second Division in 2000, where it played for three seasons. The Malay Mail was the first club team from the Klang Valley to play in the M-League Second Division. The team was forced to disband at the end of 2004 because it could not find a sponsor to continue its campaign. In fact, the team survived for almost 15 years on a shoestring budget, putting many top teams in Malaysia to shame. What kept it going was the passion of the officials and players for the “beautiful game”. A picture of The Ex-Malay Mail Veteran team players before a friendly match against UKRC in March. In a tribute to The Malay Mail team and in memory of a great friendship with the Philippines through the sport, the team has decided to rekindle its ties. Only, the players are going back as veterans! The Ex-Malay Mail Veterans team sponsors the challenge trophy and prizes for the tournament. The team will also be making a presentation of old jerseys, Milo T-Shirts and soccer balls, to a poor school team in Bacolod City. The players are paying for their trip and some friends of the former Malay Mail FC team – Milo, Line 7, Pennzoil GSR Racing Team, UKRC, Sky Bus, WRL Advertising n Production and Datuk Hishan Abdullah – have made this trip possible. 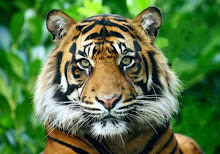 Fareez Prem Raj, Md Mashraff Mustakim, Hasnul Ramlan Khairuddin, Anto Ricchard Gomez, Muhamad Omar, Zaiddi Sabri, Masaaud Zain, Zulkarnanin Abd Talib, A. Gunasegeran, Mohd Faridzul Kassim, Aftan Mohamed, U. Supramaniam, V. Kalimutu. Malaysia and Singapore shared honours at the 40th Saudara Cup match at the Johor Cricket Academy Oval at the end of play at 5pm. Singapore's score was 226 for 6 at 5pm and both captains - Malaysia's Suresh Navaratnam and Singapore's Dharmichand Melewa agreed to call off the game for a drawn result(96 overs). This the is the third time that the Johor Cricket Council (JCC) have hosted the Saudara Cup match and previous two matches (2005 and 1987) were also drawn. Singapore only lost 1 wkt and the score at tea stands at 173/5. A total of 76 overs have been bowled. Play was delayed on the 2nd day and only commenced at 2.33pm. Singapore were all out for 165 (in 55 – 4 overs) and that was the end of the second day play. If truth be told, Dato’ Dr Harjit Singh is a doctor for Malaysian cricket. The 59-year-old had acquired his passion for the game from his father Meva Singh, who was an ex-Selangor and renowned Kilat Club cricketer. The good doctor learnt to score at the age of five, earned his personal bat at the age of six and came under the watchful eye of the famous Mike Shepherdson at the Kilat nets. As a student of English College Johor Baru, Dr Harjit made news by being among the very few picked to play in the Combined Schools for four consecutive years -- 1965 to 1968. He was a star player in his teens, representing the Johor XI as a teenager in 1966. The University of Ranchi medical graduate often made the headlines during his college days in India, captaining his college XI, playing first division cricket in the Patna Senior Division League and representing the Dhanbad District. When he returned to Malaysia in 1980, Dr Harjit was a national player until a knee injury put paid to his playing days, but not his love for the game. It is amazing how Dr Harjit’s enthusiasm for cricket has continued unabated all these years, but then the man had entered the game during its golden era in Malaysia – the 1960s. Until today, Dr Harjit, whose trademark is his humility, credits his schoolteachers Terence Jayateleka, Gurdial Singh Jr and A. Kumaran with introducing him to the workings of cricket and instilling in him a dedication to the game. The game suffered another blow in 1972 when the ministry of education dropped cricket, and rugby, from the schools sports calendar. Again, a few teachers and students kept the cricket flag flying in schools. The worst setback for cricket and sport in schools came in the mid-Eighties when the intake of trainee teachers was based strictly on academic qualifications and no consideration for sporting excellence. The likes of Yazid Imran and R. Ravindran, who were both representing the country in cricket then, had just left school and were seriously considering joining teachers training college. However, the duo from Johor was denied admission because their paper qualifications were not good enough. He set the ball rolling in Johor by introducing the Kancil Programme Catch’em Young in 1987. The aim of the programme was to popularise cricket in schools and elevate its standard in the country. 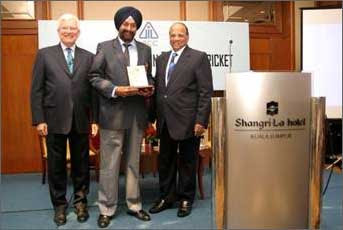 Dr Harjit, deputy president of the Malaysian Cricket Association (MCA) from 1990 to 2003 and chairman of the development, then went national with the programme. The programme is known as Hardball Cricket at national level now, but in Johor, Dr Harjit continues to use soft balls because the game can be played even in small grounds and causes less damage to the buildings in the school compounds. In Johor, even those schools in Felda schemes and kampungs get a taste of cricket. Another milestone in Dr Harjit’s career as the healer of cricket was getting the Johor government to allot 14 acres for what is now the first cricket academy in Southeast Asia. The academy, which offers first class cricket facilities, is a regional centre for the sport. Last year, the Johor Cricket Academy got a new indoor hall (below) and changing room when Dr Harjit, through the support of the Johor government and Ministry of Youth and Sports, managed to host the ICC Under-19 World Cup. Menteri Besar of Johor Dato’ Ghani Othman best describes Dr Harjit’s feelings for cricket: "He is a passionate lover of the sport. He is always prepared to go the extra mile for Johor cricket." This is not the only recognition for Dr Harjit’s efforts. His accolades have been coming from all corners of the world and in all forms – MCA, ICC, national and state awards from the government, a tournament named after him, the honour of sitting in on the Asian Cricket Council, leadership awards and above all, the respect of the world cricket fraternity. Even as the heap of praises grows tall, Dr Harjit remains what he has always been: down-to-earth and jovial. Meantime, the Johor Cricket Association once again saved the Saudara Cup – held since 1970 – from slipping into oblivion after MCA agreed to their request to allow them to host it. "The Saudara Cup is a historic competition between two friendly neighbours that created a spirit of heated but fair competition. Malaysian and Singaporean cricket lovers will be saddened if it is allowed to go into oblivion," he said. It is amazing how Dr Harjit finds time to balance his career as a doctor, family man and cricket lover. He was with the Johor Baru General Hospital for 11 years and had headed the ear, nose and throat department. Today, Dr Harjit has a private practice in Johor Baru. He readily admits that his passion for cricket would not still be burning if not for the support of his family, especially his wife of 28 years Kaldip Kaur. His two children have followed in his footsteps, with Rajinder, 24, doing his housemanship in Newcastle, Australia, and younger son Gurdip, who is with the Asia Pacific Institute of Information Technology, sharing his passion for cricket. I have known Dr Harjit since I started writing for The Malay Mail in 1981. His name was synonymous with cricket and although I did not cover cricket, I was fascinated by his passion and his contribution to the sport, especially his emphasis on grassroots development. Although Dr Harjit was in Johor, I kept in touch with him to tap his thoughts on sports development. Here is an extract of what Dr Harjit said in my column – Level Field – in The Malay Mail dated March 25, 2005, under the heading “The dying breed”. The article was a tribute to teachers who had contributed to sport in Malaysia. Dr Harjit Singh, the Johor Cricket Council (JCC) president for the past 19 years, is a dedicated worker who is an all action and hands-on man. He has seen the many phases of Malaysian sports and testified teachers of the old school are a dying breed. "We had teachers who were not only dedicated but would spend their own money to promote sports in their schools and State," said Harjit. "But times have changed, economically and socially, and we cannot blame teachers who prefer to look after themselves financially first." But that did not see Dr Harjit throw in the towel. He continues to do his part to keep the sport he loves so much alive. I conclude my acknowledgment of “Doctor Cricket” with a tribute paid to him by the Malaysian Malays Cricket Association and Old Georgian Association in their souvenir programme for the third National Indoor Cricket championship. In appreciation of his service to cricket, the tournament’s challenge trophy was dedicated to him. This is what was written about Dr Harjit. Cricket, the game of gentlemen, has produced many gentlemen, on and off the pitch. Many were wonderful people who were great players and administrators. Among them is a special breed of a cricket player who has and continues to dedicate his whole life to this sport even after his playing days. One surefire character that is part of this special breed is the man they call “Mr. Cricket”. For this man, a fanatical supporter of this game, nothing comes between him and cricket. It is a lifelong dedication; one that has seen him well loved and greatly respected as a player and now as an official. Today, his drive and vision has seen the birth of the first cricket academy in South East Asia – the Johor Cricket Academy. This man is none other than the gregarious Dato’Dr Harjit Singh. 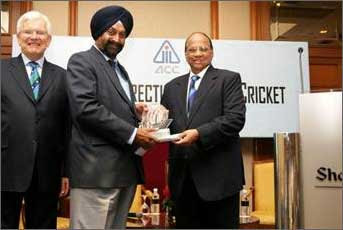 Dear Dato’ Dr Harjit, we salute you for your great service to cricket. Your work is a legacy that will live on forever in the fraternity. Played for English College Johor Baru from 1963 to 1966. At 16, Dr Harjit became the youngest player to represent Johor in the senior Malaysian Cricket League in 1966 and with his high scores, found a place in the Malaysian Cricket Association President’s XI in 1968. Captained his Medical College XI and represented Ranchi University and Dhanbad District while studying medicine in India. Captained Johor state cricket team in the national league from 1982 to 1985 and returned to play for Malaysia in 1980. Johor Cricket Council President since 1987. 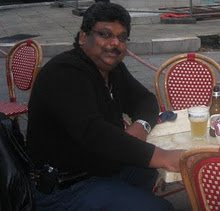 Malaysian Cricket Association Deputy President from 1990 to 2003. Introduction of the first primary schools cricket programme in Johor in 1987 and later at national level. Organised the first Under-12 national level cricket tournament in 1992. 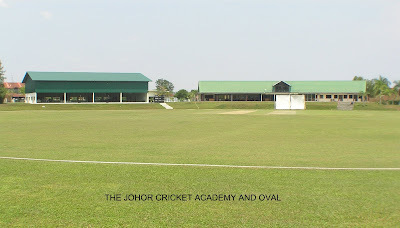 Founder of the first Cricket Academy in Southeast Asia – the Johor Cricket Academy situated on a 14.25-acre site, housing the first Indoor Cricket Hall in Southeast Asia. Malaysia’s representative in the Asian Cricket Council and the International Cricket Council from 1991 to 2002. Johor Sports Leadership Award (Tokoh Sukan) 1989. Special award (Anugerah Khas) for contribution to cricket by His Majesty the King of Malaysia, the late Tuanku Jaa'far Tuanku Abdul Rahman at the National Sports Awards (1998). Global winner of the International Cricket Council Lifetime Service Award (2005). (First Malaysian and only the second Asian to have won this award. The first Asian was Zakir Hussain Syed of Pakistan. This is the only team or individual award won by Malaysia from the ICC. This year (2009) MCA President, Tunku Tan Sri Imran was bestowed the same award. The hockey brains of senior veteran double international M. Kalimuthu (soccer and hockey) and a young veteran, former national junior hockey player, St John Davies, won Royal Selangor Club the 9th UKRC-astro International Soccer 9's this evening at the Ulu Klang Recreation Club ground. The deadly combination saw St John scoring the winning goal off a calculated lay by Kalimuthu in the second half of extra-time for the solitary goal to crack a tough nut in debutant to the tournament, Korean Football Club. The two day tournament saw twelve teams including hosts, UKRC, battle it out for honours. UKRC president, Andrew Gopal and his club members indeed must commended for an outstanding effort in organising the tournament of international standards. Accolades for the club were free flowing at the official dinner last night at the club. Besides, The Korean Club, the other debutantes were the Gold Coast Koalas team from Australia, who won the Fair Play trophy, and Prince of Songkla University, Thailand. For a small community based club, good job and well done UKRC! Today is the 12th death anniversary of mother, Rosemary Meenatchi Mariadass. She was only 57 years old when she left us and it was indeed a young age. I believe her health took the toll, when my brother Jeyaprakash Anthony passed in 1993. She was so devastated by the death of my brother that she was never the same again. Which mother will not be devastated to lose a 29-year-old soon. We all felt the pain, but my mother let his death take the toll on her. Besides, Jeyaprakash was born five years after me and I was told that my mother was so upset that she not conceive a child after me. Thus, when Jeyaprakash was born on Nov 17, 1963, he was like a "golden child". Of until then I was the "golden child" that my nickname is Aja - short for Raja (King). Although after Chinna (Jeyaprakash) my sister and two brothers were all born within the next five years, Chinna remained special to my mother. So his passing away was something she could not handle, coupled with her other worries, her health suffered. Today, I have lost my brother, mother and father who passed away two years ago. It has been a trying period for me too as the eldest child. As much as life goes on, I certainly wished all three of them were still alive.Things would have certainly been different for me. But I cannot do anything about it and just feel that it was my fate. My ammah has always been a caring and loving woman who has made many sacrifices in bringing us up. And again, I must say this, just like I said for Chinna, there was so much more I could have done for her. So to all those who have aged parents and brothers who are alive, be grateful and thankful. You will not know what you have, until they are gone when it will be too late to make amends. I had done to the best of my ability to both my parents and brother, but I just believe I could have done more. Thus appreciate your parents and sibblings, although at times they may be persistence or testing your patience. They never meant meant any harm. It was all out of love. As I chug along, now having my own children, I can't but help think if things were different. But I will not get the second chance and I can only pray for my mother, father and brother that they are in a more peaceful place and all their sufferings are rewarded with goodness. I also pray that they look down on us on us once in a while and shine the guiding light upon us. Rest in peace and may the lord grant you all eternal rest! We all miss you ammah, appah and chinna! Athletics coach Rennie Martin was honoured by the who's-who of the athletics fraternity which included teachers, sports journalists, family, relatives and relatives at the Commonwealth Club at his 75th birthday last Friday. I received a call last week from Suresh (Rennie's eldest son) who introduced himself and said that his father was celebrating his 75th birthday, and would love to have friends from over the years at his party. I did not hesitate for a moment to agree, but then I realised that I had a prior engagement on that same evening. I asked Suresh if the party will gone on late and that I can only make it after 10pm. Suresh said that the party will go on past midnight. I immediately promised Suresh that I will be there. I know Rennie since my early days as a sports journalist when I started stringing for The Malay Mail in 1979, as I covered the schools beat. Rennie was a well known athletics coach who specialised in jumps.He started as school teacher athletics coach, and later became a national coach. My respect for Rennie started as early as 1980 when one early morning on April 21, I got a call from Rennie at my home, asking me to be at the Merdeka Stadium in 30 minutes. He was then a coach in the Selangor Schools Talent Camp (Kem Bakat) and told me that if I wanted a good story, I should pull myself out of bed and be there! Rennie said that a 15-year-old boy from Kuala Kubu Baru is going to smash the State record in the 1,500m. I got on to my Honda kapchai and headed for Merdeka Stadium. I was there in 15 minutes and headed straight to Rennie to ask him what was happening. 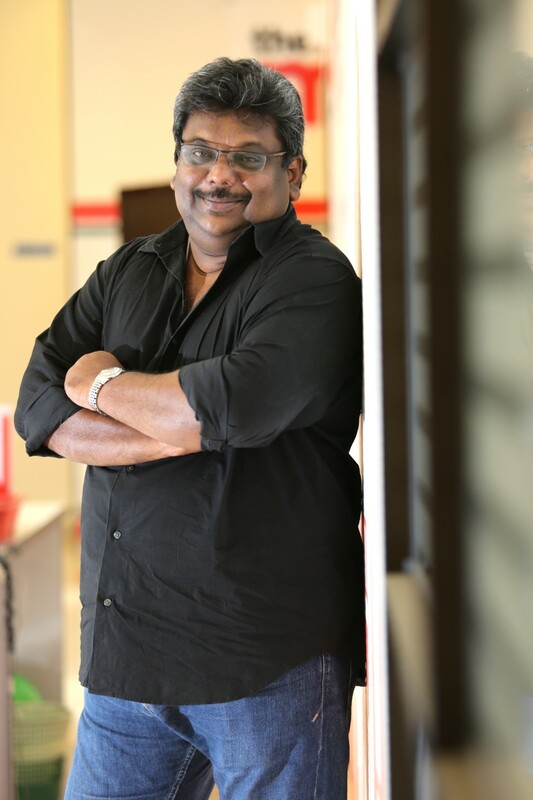 He replied: " In ten minutes you are going to see a future talent of Malaysia emerge." And there was this lanky, skinny looking boy at the starting blocks for 1,500m. As Rennie had predicted, this boy - B. Rajkumar - went to rewrite the record with a time of 4:16.1s to beat the old mark of 4.17.7s by M. Raju in 1971. Suresh (1st left) with the the Raj Kumar article I wrote because of Rennie's wake-up call in 1980. Others in the picture: Tripadi, Rennie, Dennis Shepherdson and Jeya Kumar. Rajkumar went on to become an Olympician. The point is, Rennie had an eye for talent and he seldom was wrong. It was that day too that I met another dedicated teacher coach, A. Tripadi - the coach who unearthed Rajkumar and coached him. Don't Forget The Grassroots (Read here). My immediate reaction after Suresh's call was to get in touch with Tripadi and Rajkumar and bring them to the party. I had no problems getting in touch with Tripadi who was thrilled to attend Rennie's party, but I failed to get i touch with Rajkumar despite numerous days of effort. In anycase, I picked up Tripadi that night at the National Sports Council in Bukit Jailil (Tripadi is an athletics coach with them) and headed for the Commonwealth Club. When we arrived at about 10.30pm, we were greeted by Rennie's daughter Sumitha (whom I had known from her days in New Straits Times as a journalist) and Suresh (whom I met for the first time) and were taken to the hall to meet their father. Indeed, it has been a longtime since I saw Rennie and when I saw him in the hall, he was not a day older than when I first met him in 1979. As I apologised for being late, he just gave me a hug and said :"I am just happy that you have come." I then moved on to meet some of the who's-who who are still around. Many had left and I certainly missed a golden opportunity to catch up with them. I also missed a specially prepared "slide show" of Rennie's activities which was prepared by his children. I was told it was excellent and brought back memories of the glorious years of athletics. Just to list out some of the 80 people who were present on Friday night include Tan Sri Porf Khoo Kay Kim, Datuk Arthur Edmonds, Datuk R. Yogeswarn, Datuk Nashatar Singh, Brother Felix James Donohue, Karu Selvaratnam, Freddy Vias, N. A. Baskaran, Nelson Chandran, A. Tripadi, Leslie Armstrong, Mike Nathan, Param, Ishtiaq Mubarak, P. Selvarani, Dennis Doss, Dennis Sheperdson, Karim Ibrahim, S. Vegiyathuman, Arumugam, Benedict Martin, R. Nadeswaran, a host of relatives and friends. It was indeed a great night and all left with the hope to be around for Rennie's 85th birthday! This article is long over due and I apologize to Rennie and his family who were wonderful hosts. But for those of you still do not know much of Rennie, I will be posting another article about him. I interviewed Rennie early this week and it was indeed an interesting session. Watch out for it next week. Happy Birthday again Rennie and till we meet again, cheers! (From left) Rennie, Dennis Shepherdson and Karuselvaratnam. Evergreen Rennie rendering a song! The birthday boy about to cut the cake with his family around him.